Natural-gas futures for May delivery (and most future months) surged 10.5 cents, or 2.3%, to $4.6910 a million British thermal units on the New York Mercantile Exchange. The market had been trading lower prior to the announcement as traders waited for the first increase of the year in stored supplies. The U.S. Energy Information Administration reported the amount of natural gas in storage rose by just 4 billion cubic feet in the week ended April 4 to 826 billion cubic feet. Analysts had been expecting an average increase of 13.75 billion cubic feet, according to a survey of 20 analysts by The Wall Street Journal. The increase was less than half of the recent five-year average for the week. 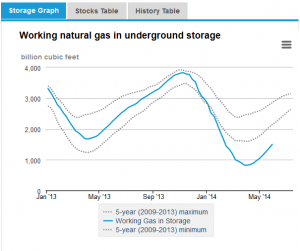 With the weak first gain in stockpiles of the season, the market is questioning whether companies will be able to produce enough gas to have enough in storage at the start of the next heating season in the fall. Inventories are at the lowest level since 2003 after a severe U.S. winter prompted extraordinary demand for natural gas, which is used to heat more than half of U.S. homes. The EIA expects supplies to reach 3.422 trillion cubic feet by the end of October, which would be a nine-year low. This entry was posted in Uncategorized on April 10, 2014 by coreenergy.